Car salesman Jerry Lundegaard (William H. Macy) hires two men named Carl (Steve Buscemi) and Gaear (Peter Stormare) to kidnap his wife so they can get some ransom money out of her wealthy father. However, when some bystanders are murdered in the process, pregnant police chief Marge Gunderson (Frances McDormand) starts to investigate and quickly closes in on the two men and their accomplice. The Coen Brothers' "Fargo" is a darkly humorous neo-noir crime thriller from 1997. It was nominated for seven Academy Awards, including Best Picture, Best Director, Best Screenplay, and Best Actress. We love the Coen Brothers, and this is one of the reasons why. This is a brilliant film, deserving of every accolade it received and probably deserving of some it didn't receive (we are looking at you, best picture trophy). Francis McDormand took home the Oscar for her portrayal of pregnant police chief Marge Gunderson and is amazing in the part. Her performance is wonderful with her exaggerated northern Midwest accent. In her police work, she seems to be rather nonchalant, but is extremely effective in the manner she investigates the crimes she is presented with on a regular basis. 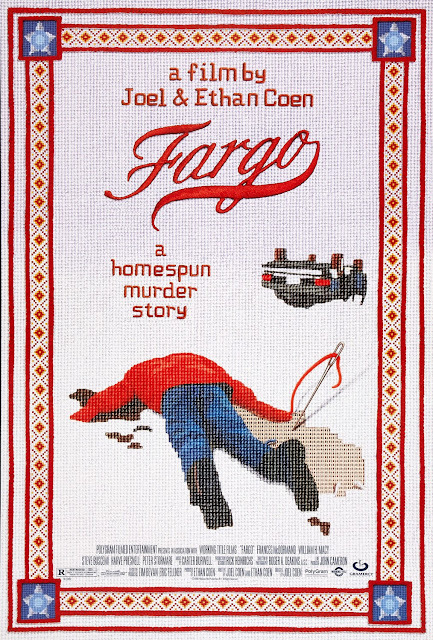 Though Marge Gunderson is the protagonist of this story, she doesn't pop up until about a third of the way into the film, even after the first set of murders have been committed. The Coen Brothers are known for their unique approach to film making, and their off beat style certainly comes through here. To wait this long to see the hero of the story and to develop and establish the villains first is not something we see often while watching movies. This unique take is both compelling and intriguing. The actors who play the aforementioned criminal element are wonderful as well. William H. Macy plays the squirrelly, shady car salesman named Jerry Lundegaard, who is the so-called mastermind of the whole scheme despite the fact he isn't too bright. Macy is superb here, offering up a character with a clear lack of confidence and a perpetual look like he is hiding something. It's interesting to note that Macy basically begged the Coen Brothers to be part of this movie, and now that we've watched it again, we really couldn't see anyone else playing this part. Steve Buscemi is great as the loud mouthed Carl, who talks incessantly and seems to have a constant chip on his shoulder about everything and anything. Peter Stormare is also amazing as the more stoic and subdued sociopathic Gaeare. Together, this dynamic duo is tasked with kidnapping Jerry's wife in exchange for some money, but this quickly begin to unravel fast. This fabulous cast combined with the expert story telling of the Coen Brothers makes for an extremely enjoyable viewing experience. It's not a very grandiose film, but because of this, it is allowed to shine as the smart, super violent, hilarious dark comedy it is meant to be. One year ago, we were watching: "The Great Dictator"